If you want to do your irrigation the smart way, you need a smart sprinkler controller. 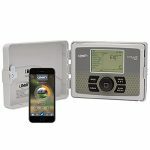 This is an irrigation automation intelligent system that connects to other devices either via Wi-Fi or GSM cellular. If you are always on the go, you can still water your garden remotely; in the office, or on a date. 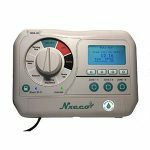 These sprinkler controllers are also a great deal if you want gardening intelligence, and above all, substantial water savings and even 100% rebates in some regions and localities. 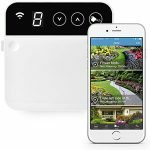 But what’s the best smart sprinkler controller in 2019? In this buying guide, we will first recommend the top products that should be on your wish list. After that, we will discuss all the critical aspects that you should consider when buying smart sprinkler controllers. Amazon’s Rachio 2nd Gen is available in two options; 8-zone controller for small lawns and gardens and 16-zone models for larger gardens. So far, it is the best rated smart sprinkler controller on Amazon and definitely the best selling. First, this Wi-Fi sprinkler controller is EPA WaterSense certified and that guarantees you up to 50% savings on your water bills. In some regions, you even qualify for 100% rebate on water bills. The Weather Intelligence technology also makes Rachio an excellent smart gardening system. It imports forecasts from the top weather platforms for better accuracy in adjusting the watering schedule. Besides the convenience of an intuitive mobile app, it is also compatible with Alexa and Google Assistant. The only sacrifice with Rachio is that there are no onboard controls so you’re limited to the mobile app and may be voice control. Skydrop is not such a popular brand but is one that every smart gardener should love. It is among the best Wi-Fi and Alexa sprinkler controllers under $100 and offers almost the same features and performance with bigger brands like Amazon Rachio. The Halo is available as 8-zone only offers the easiest installation. Usability is excellent as it can be operated from the mobile App, and Alexa as well. It also has onboard controls and a display. Skydrop Halo is also EPA WaterSense certified, but it won’t yield much savings like Rachio that uses Hyperlocal Weather Intelligence™ Plus. The problem with this sprinkler controller is that the construction is not tough enough to withstand the rugged nature of gardening. But for the price, it is a great deal for indoor use. 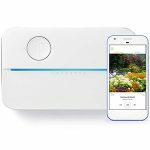 This is the latest release from Rachio and definitely the best smart sprinkler controller in the market. It shares a lot of features with the 2nd Gen Rachio, but it is more expensive, but for a reason. Just like the predecessor, there are two options; 8-zone and 16-zone variations. This smart sprinkler will guarantee you the best water efficiency and most importantly, a lush lawn and healthy garden. One of the latest additions to this unit is the Weather Intelligence Plus. This is a technology that uses hyperlocal weather and not just updates from other weather platforms that are at times wrong. Rachio 3 uses satellite radar data too in weather monitoring. Other additions are 5GHz Wi-Fi and compatibility with Rachio Wireless Flow Meter system. It also has better usability courtesy of onboard controls though it is not very intuitive and lacks a display. Rachio, Rainmachine, and Nxeco all need enclosures if they are to be used outdoors. However, with the Orbit 57946 B-hyve, you are ready to go; whether indoors or outdoors. It comes with a hard shell enclosure that will keep the main unit away from extreme outdoor conditions like UV rays from the sun and also rain. The Orbot B-hyve is available in the 6-zone option and the 12-zone. Usability is top-notch courtesy of an intuitive mobile app, web app, Alexa and Google Assistant as well as a host of other integration. There’s also a user-friendly onboard interface with buttons and a digital display. Regarding the efficiency, Orbit B-hyve is EPA WaterSense approved and certified and in some regions, you may qualify for rebates also. The best thing about Orbit 57946 is that it’s very affordable and you can snap it for just a hundred bucks! This is another little-known brand but one with reliable irrigation systems so far. The NX8 series is available in several sizes; 8 zones, 12 zones and 36 zones. We tested the 8-zone Nxeco NX8 (HWN8-200). First it doesn’t come with a cabinet, but the construction is far much solid than Rachio, and Lovatic Rainmachine. It can take more abuse and actually comes with a knob which is more durable than buttons or touchpads. 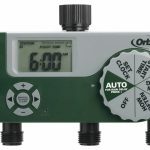 This controller is EPA WaterSense-certified and boasts a range of connectivity options. You can use the mobile app, voice control or the onboard controls. The Smartphone app is quite hard to get acquainted to for first time users. But that’s not reason enough to snub such a great smart irrigation system for less than $100. If you are on a budget, grab the Rain Bird Simple-to-Set. 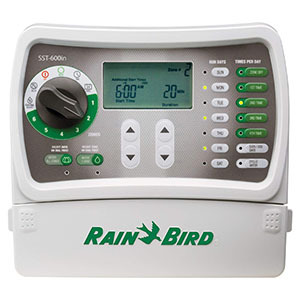 This is a 6-zone controller, but there are also Rain Bird 4-station, 9-station and 12-station options. It is quite similar to Nxeco NX8 in that it also has an adjustment knob and a display. The highlight is the cheap price tag. So far, this is the best smart sprinkler controller under $50 that I have come across; the rest are trash. It is a pretty basic model that won’t do complex operations like programming simultaneous watering schedules. Unfortunately, it is not so intelligent and may not yield so much savings at the end of the month. Notice that this model is not EPA-CERTIFIED. Another shortcoming, the design is not as tough as you’d expect, so you’re strictly limited to indoor use only. This is a 2nd Generation model and brings on board better weather forecasting and ultimately, more water savings. This Rain Machine controller is designed for 8-zone systems and is for indoor purposes only. You can tell that by the sleek and stylish construction as opposed to a sturdy construction like Nxeco. The onboard interface is not so intuitive, but you have all the basic controls via a touchpad system. The control panel is illuminated so you will still manually operate the controller even in the dark. Regarding water savings, this is an EPA WaterSense-certified. It uses NOAA weather updates as well as real time wind, temperature and rainfall data to adjust the watering schedule. This model isn’t truly smart, but we like its blend of performance and affordability. It is the best programmable sprinkler controller under $50. Orbit 56082 is available in two options; single-zone, 2-zone, and the 3-zone that we reviewed. The unit doesn’t offer Smartphone operation or voice control and any other integration. But you can manually program it courtesy of the onboard controls; an adjustment knob, buttons, and a display. Among the notable features is the Rain Delay function. That pauses the schedule for a day, two days or three. The problem with this controller is leakages, so you wonder, does it really save water? But for the price, it’s somewhere you’d want to start from if you’re on a tight budget. Now that you know the best Wi-Fi sprinkler controllers in the market, it is time we discuss a few important aspects that you should be aware of before buying these smart irrigation gadgets. So, without further ado, let’s get the ball rolling. Also known a Wi-Fi sprinkler controllers, or Wi-Fi irrigation systems, a smart sprinkler controller works just like your traditional sprinkler controller, but it is intelligent and connects to other smart systems. They have sensors that adjust the sprinkler’s runtime based on the local real-time weather feeds. It’s hard to convince a gardener to spend up to $200 on a WiFi sprinkler controller when the traditional controller is in place and functional. But a smart sprinkler is a smart idea, especially if you have a tight schedule and you want to cut down on bills at the end of the month. Here are the reasons why the smart sprinkler controller should be a priority for any gardener out there. Weather awareness – Smart sprinklers integrate with other weather platforms and know when they should water the lawn and when not to, depending on the real-time weather. Savings – Rachio 3 may save you up to 50% of your gardening water bills. Other models, especially the EPA WaterSense-certified models will bring down gardening water costs by at least 20%. Smart scheduling – Smart sprinklers can be programmed so you can confidently go on a trip without minding about your lawn’s irrigation. Remote control – The fact that you can n=monitor your lawn or garden remotely makes Wi-Fi sprinkler controllers a great purchase. Gardening intelligence – The advanced models can fully automate your gardening by even importing the local watering regulations and abiding by them autonomously. High-end models like Rachio will calculate the time it would take for water to evaporate or run off and sets a balance in that you’ll never find the lawn soggy or dry. If you aren’t so sure about the criteria for choosing the best smart sprinkler controller, here is a checklist of the items you need to consider. There are so many Wi-Fi sprinkler controller brands; from the household names to the cheap ones including the generic stuff. We always advise our readers to buy from the top brands because they offer excellent value for money. So, what brands should feature on your wishlist? The best smart sprinkler controller brand is of course Rachio. But of course we have some other reliable brands; the likes of Orbit, Hunter, Rain Bird, Skydrop, Netro, among others. Avoid the little-known brands at all costs. They have very enticing price tags, but at the end of the day, you might regret. Where are you installing your smart sprinkler controller? Some models have been specially designed for outdoor installation while others are strictly for indoor use. The shell casing of outdoor sprinkler controllers is made of UV resistant material, and that’s why it’s resistant to extreme weather, especially the scorching summer sun. The entire box is also waterproof to keep off any leaks onto the motherboard and other electrical components. 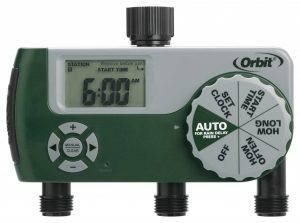 We recommend outdoor sprinkler controllers because they can also be used indoors; for example, the Orbit 57894 Smart Sprinkler Controller. I mean, you never know when you might shift your gardening to the outdoors. The number zones that your sprinkler controller can handle is critical. For starters, one zone refers to the area under one vale of your system. It is imperative to note that controllers vary in the number of zones they handle. We have six-zone controllers, eight and even sixteen-zone Wi-Fi sprinkler controllers. ….The rule of the thumb here is to ensure the controller you buy serves all the valves in your garden or lawn. That is to say; if you have an eight-valve irrigation system, you need a controller that covers at least eight zones. At times, the ‘zone’ will be referred to as a station. Smart sprinkler controllers are just as intelligent as your Smartphone. They can adapt to the changing weather pattern and adjust accordingly in real time. The best brands use the latest weather forecast technology like Metno and NetAtmo for real-time and accurate updates. This technology of gathering weather forecast from the top weather update platforms is commonly known as WeatherSense. The efficiency of your smart sprinkler depends on the accuracy of the adjustments it makes. This varies from model to model depending on the mode of weather capturing. The best systems depend on more weather platforms, and that’s why it’s rare to catch Rachio 3 off guard. Weather Intelligent Plus technology in the Rachio 3 is fantastic. It will hardly miss the light showers or even the slightest change in humidity and temperature. Every brand promises water efficiency, but the true mark of an efficient smart sprinkler is EPA WaterSense Certification. This is a partnership by the U.S. Environmental Protection Agency to promote water conservancy. EPA WaterSense-certified controllers are verified efficient smart sprinkler controllers and guarantee real water savings. They also offer measurable water savings compared to what the market offers. A WiFi sprinkler without WaterSense certification is not efficient. Besides the convenience and savings, some WaterSense products are also eligible for up to 100% rebates which is another excellent idea. In two summers you should have recouped your investment on a smart sprinkler controller. A backup battery only won’t store the controller’s data and settings. You also need a non-volatile memory. This piece of hardware is responsible for keeping data in the event of a power outage. Smart sprinklers connect with other devices and can be controlled remotely from your phone, either via GSM cellular and Wi-Fi or even using voice assistants like Alexa and Google Assistant. Some come with onboard controls while others only offer remote operation only. It is all a matter of preference, but we recommend sprinkle controllers with built-in controls. You don’t need to have your phone or Wi-Fi to operate your sprinkler controller. Your part-time gardener can also manage it; no need to call all the time when you’re busy elsewhere. A lot of people assume that smart sprinkler controllers mean the same thing as Wi-Fi sprinkler controllers. Well, this is not far from the truth because all Wi-Fi sprinkler controllers are smart. However, not all smart sprinkler controllers are Wi-Fi sprinkler controllers; some are GSM-based. Arduino is among the few brands that offer GSM cellular smart sprinklers. But most smart sprinkler controllers, as well as smart soil sensors and a whole lot of other smart home solutions are Wi-Fi based. They have more advantages compared to the GSM counterparts so if you want the best smart garden experience, go for a Wi-Fi sprinkler controller. Wi-Fi connectivity guarantees versatile connectivity; from your Smartphone, as well as other smart gardening systems. The average smart sprinkler controller doesn’t have a battery because it draws power from the sprinkler’s circuitry. The disadvantage with these systems is that when the power goes off, the sprinkler won’t do its job and worse enough, it will lose the memory. A few advanced models come with a DC battery backup. The essence of this battery is to keep the memory until the power comes, but it won’t run the sprinkler. The battery is just for keeping the unit awake for a short time, but if you experience prolonged power outages, a smart sprinkler with solar battery backup will be a great purchase. How much do smart sprinkler controllers cost? Well, the prices range from $50 all the way to $300. Obviously, it’s the top brands and high-end models that dominate the ceiling prices. They have more and better features. But that doesn’t mean that all expensive smart sprinkler controllers are the best. Some are expensive but don’t guarantee value for money regarding features, efficiency, flexibility, and durability. Even though there’s always Quality Control (QC) in manufacturing, your sprinkler controller may develop problems along the way. An extended warranty is something you should always be on the lookout for. But it’s not just about warranty length; also make sure you are buying from a genuine brand. These little-known brands and even some household names are not sincere when it comes to fulfilling the warranty. Reading customer reviews might help you identify a brand that’s ready to help and those that ignore their clients’ needs. On your side as a buyer, endeavor to read and understand the terms and conditions of the warranty. Installing a new smart sprinkler controller shouldn’t be much of a bother as it is compatible with the old system. The existing valve wires will plug into your smart controller without a problem. Then, power up the device, install the app and you’re ready to go. You can choose the onboard controls or the mobile app, as well as Alexa. It’s important that you go through the installation guide provided. Also, refer to the resources online and if need be, contact customer support. First, you won’t be able to operate the controller remotely; either on the mobile app or voice control and 3rd party integration. If you have onboard controls, you’re lucky as you still have control over the irrigation system. Regarding the schedules, most controllers will still use the seasonal data to manage the system. Are there additional fees for running smart irrigation systems? No. There are no subscriptions or monthly payments for running a smart sprinkler controller. 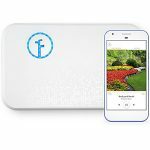 Indeed Rachio 3rd Generation is the best smart sprinkler controller in the market right now. It’s quite expensive, but it’s the real deal at the moment. You want more savings on your water bills and a lush green backyard, get Rachio 3. 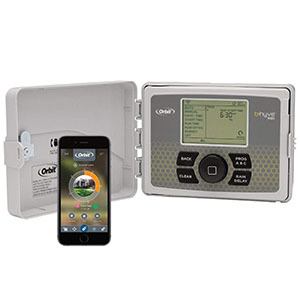 Smart irrigation controllers are a little bit pricey, but they offer excellent value for money. Besides the convenience of automatic operation, they are intelligent. 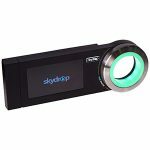 They adjust to the real-time weather changes, connect with other smart systems and offer the convenience of remote operation and monitoring. Above all, they are more efficient in that they won’t water the garden when it is just about to rain or after rain. And that’s it for today ladies and gentlemen. 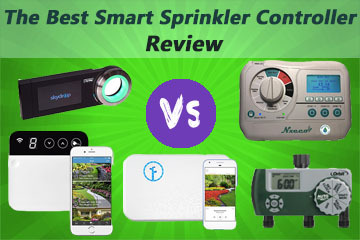 We hope that this review of the best smart sprinklers will make you get value from your money. Until next time, we wish you an excellent gardening experience!